Ruling Congress' corporator R Sampath Raj was elected as the 51st mayor of Bengaluru's civic body. 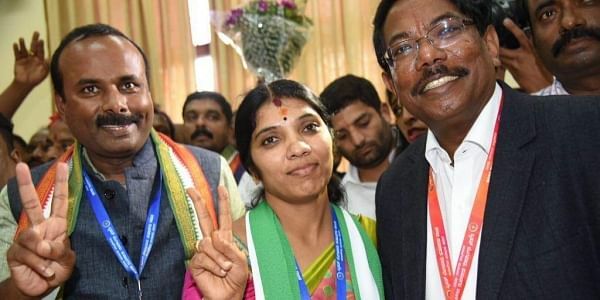 BENGALURU: Second-time councillor R Sampath Raj of the Congress and first-time councillor Padmavathi Narasimhamurthy of the Janata Dal (S) were elected as the new mayor and deputy mayor of the Bruhat Bengaluru Mahanagara Palike (BBMP). The 47-year-old Sampath Raj represents Devarajeevana Halli ward in Pulikeshinagar Assembly constituency. He is expected to play an important role in the upcoming Assembly eelctions in 2018. He was backed by chief minister Siddaramaiah, power minister D K Shivakumar and Bengaluru development minister K J George. With the help of the JD(S), Sampath won by 139 votes against the BJP's Muniswamy. Amidst the BJP's protest during the election, Congress and JD(S) voted for Sampath. The new mayor said he will make Bengaluru garbage free, develop roads and install CCTV cameras at major junctions for women’s safety. "I will create awareness among the public about garbage segregation at source," said the new mayor. He also emphasized the need for good roads. "I am aware of the damage to roads in the recent rains. I assure people that in the coming days they will have a smooth ride," he said in a press conference soon after his election. On women's safety, Sampath said that in next 15-30 days, all major roads and intersections near IT-BT companies, educational institutes and commercial establishments, CCTVs would be installed. "Funds have been allocated in the previous term, and they will be spent," he said. An educationalist, Sampath said that with the help of private companies’ CSR initiatives, BBMP schools and colleges would be developed. Padmavathi, who represents Rajagopalanagar ward in Dasarahalli Assembly constituency, won the deputy mayor’s post by 138 votes. She was backed by former prime minister H D Deve Gowda, the JD(S) supremo.